The City of Red Deer hosts the "Red Deer Lights the Night", an annual holiday celebration that features the lighting of the Christmas lights in beautiful City Hall Park and Red Deer’s Christmas Holiday Tree. Held on a Saturday in November, the event offers free popcorn and hot chocolate, live entertainment, children’s crafts and activities, and of course, a visit from Santa. 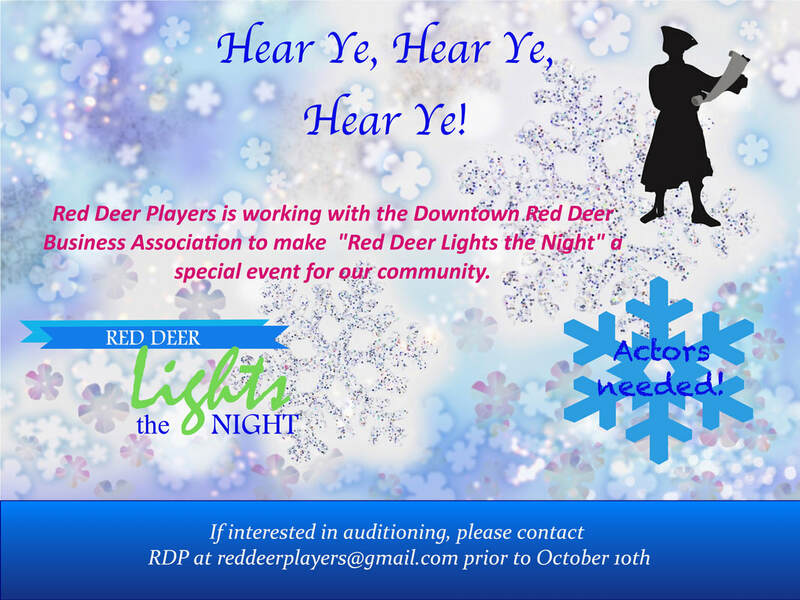 ​This year, Red Deer Players will be working with the Red Deer Downtown Business Association on this fun, family night. Looking for 3 actors (at least 2 must be male)., preferably 30 yrs of age, or older. The roles? 3 "Town Crier Style Event Ambassadors"
The script costs of important information and event times that must be proclaimed among the crowd at key times. The role also involves greeting the public, answering questions and adding some improvisation to enhance the authenticity of the role of "Ambassador/Crier"
As this is an outdoor event in November, ability to be outside for a period in excess of 3 hrs in cold weather, along with the ability to move among the crowd throughout the event is a must.